tenminutestops.com | Ten-minute thoughts that take you to the top. : Fiesta, Fiesta! A Bangus Festival in Pangasinan! 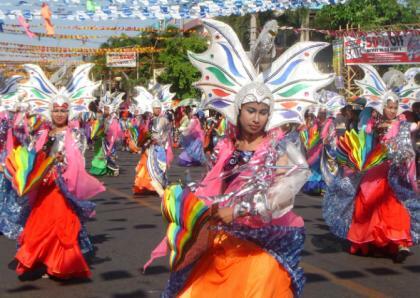 The Bangus Festival is from April 8 - May 1. Celebrate with us! 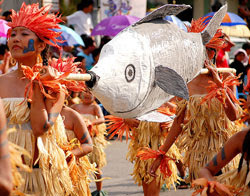 This year's Bangus Festival kicks off on April 8 and culminates on the 1st of May - the country's labor day holiday and also our town Pista'y Dayat (Sea Festival). In the past, the Pista'y Dayat has been the main draw of Dagupan City every May 1st, with locals and tourists all heading out to the Bonuan Blue Beach and Tondaligan Beaches to cool off in the summer. The Bangus Festival was initiated to complement the Pista'y Dayat, but now the Bangus Festival has become a main event in itself. The "Kalutan ed Dalan" is a Bangus festival tradition wherein the entire stretch of our city's downtown AB Fernandez Avenue is closed to traffic and lined from end to end by grills with glowing charcoals and Bonuan bangus for grilling. 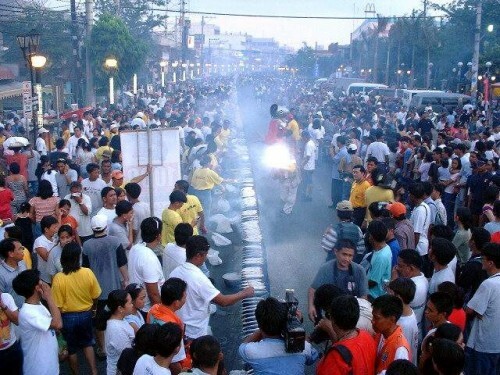 Last 2004, the city was recognized by the Guinness Book of World Records for staging the longest barbecue of the world and got for the city the title too as the Bangus Capital of the World. One of the more admirable things about this year's festival is the effort of the current city mayor Benjie Lim to "bring the festival back to the people." Mayor Lim really sent the message out to our kabaleyans that the festival is ours and as such, we should take an active part in it, and naturally, benefit from its fruits - in terms of business opportunities. This is a change from previous years where the organization of the festival was limited to only a few business interests, as such it did not become a real community effort. I do not endorse Mayor Benjie Lim (or anyone for that matter), but I like what he endeavors to achieve this year. When the festival started, it was held in AB Fernandez Avenue. It was moved to the Jose de Venecia Highway in the last 2 years to accommodate the business interests of a few; but now, it's going to be back where it was born and where it belongs. Come celebrate with Dagupan City and all of Pangasinan! Visit our city from April 8 to May 1 and join in on the festivities of the city I am very much proud of. Looking for other things you can do on your own in the city? 1) By Bus: Take the Victory Liner (Pasay or Cubao Stations) or Five Star Bus Liner's buses heading for Dagupan City. It's a 4-5 hour trip. Get off at the bus station in Dagupan City (the last stop), and just roam around town via the Downtown Jeepney or the tricycles. 2) By Car: Take NLEX, then take the Mabalacat exit (last exit), then follow the road to up to Urdaneta City. In Urdaneta, take a left at the Urdaneta-Calasiao Road, then when you hit an intersection (where there's Jollibee, a Toyota Showroom and the Pangasinan Regency Hotel), take Caranglaan Road until you hit Perez Blvd. That's Dagupan City Proper. Just follow the route of the Downtown jeepneys to go around town.